U.S. greenhouse gas emissions fell 2.7 percent from 2016 levels, according to the EPA. Emissions on a per-capita basis hit a 67-year low last year, federal data shows, and supporters are touting EPA’s data as proof Trump’s agenda is working. EPA’s new data comes on news that, globally, greenhouse gas emissions are set to rise to historic highs by the end of the year, despite nearly 200 countries signing the Paris climate accord. Greenhouse gas emissions continued to plummet during President Donald Trump’s first year in office, according to new Environmental Protection Agency (EPA) data. Based on data from more than 8,000 large facilities, EPA found greenhouse gas emissions, mostly carbon dioxide, fell 2.7 percent from 2016 to 2017. Emissions from large power plants fell 4.5 percent from 2016 levels, according to EPA. “Thanks to President Trump’s regulatory reform agenda, the economy is booming, energy production is surging, and we are reducing greenhouse gas emissions from major industrial sources,” EPA acting Administrator Andrew Wheeler said in a statement. Earlier this year, the Energy Information Administration reported that per-capita greenhouse gas emissions hit a 67-year low during Trump’s first year in office. China is the main culprit behind rising emissions, but India and other developing countries contribute. However, recent reports have detailed how European countries aren’t on track to meet their own emissions reduction goals. A recent report from the Climate Action Network Europe found that emissions cuts among most European Union members were “nowhere close enough” to meet the goals of the Paris accord. Trump pledged to withdraw from the Paris accord at the earliest possibility, in 2020. On the flip side, the U.S. led the world in emissions cuts for the ninth time this century, according to the oil giant BP’s annual energy statistics. BP reported that European Union “emissions were also up (1.5%) with just Spain accounting for 44% of the increase. Long held up as a poster child for fighting global warming, Germany is on track to miss its 2020 emissions targets. The government will likely instead push its goal of cutting CO2 emissions back to 2030. 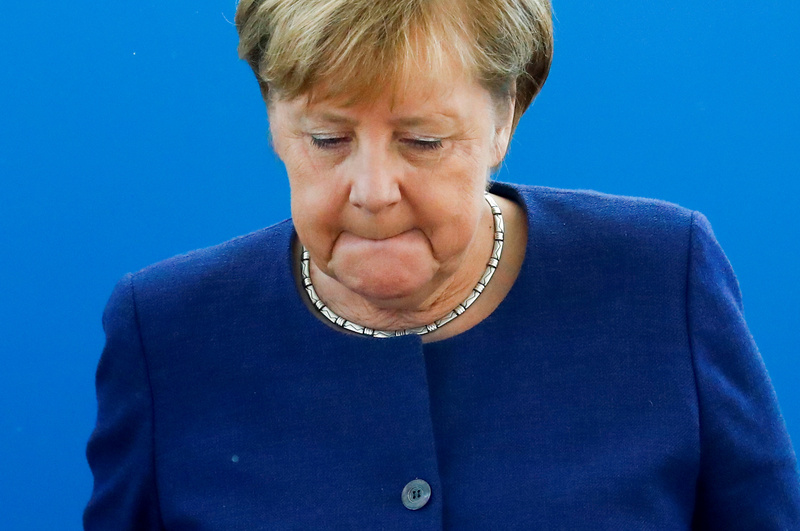 German Chancellor Angela Merkel attends a Christian Democratic Union (CDU) leadership meeting in Berlin, Germany, October 15, 2018. REUTERS/Fabrizio Bensch. Europe’s recent struggles with emissions cuts has emboldened supporters of Trump’s approach to emissions cuts, prioritizing private sector technology over government regulations. “These achievements flow largely from technological breakthroughs in the private sector, not the heavy hand of government,” Wheeler said in a statement. However, critics of the Trump administration’s deregulatory agenda say actions today will cause emissions to increase in the future. Environmentalists and some states have sued to stop the administration rolling back Obama-era environmental regulations. Democrats and environmentalists hope to use Trump’s rolling back of environmental regulations to drive voters to the polls in November. “We know what everyone who wants to fight back must do: vote on November 6th. We know where the allegiances of Trump and his accomplices in Congress lie. Now it is up to us to make the change that is needed,” Sierra Club executive director Michael Brune said in a statement. 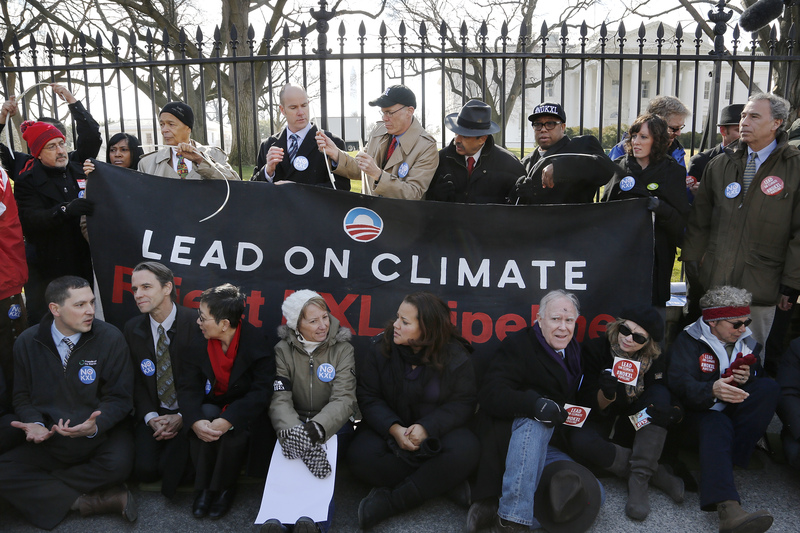 Civil rights activist Julian Bond (top row, 3rd L), Sierra Club Executive Director Michael Brune (top row, 4th L), and activists opposed to the Keystone XL tar sands pipeline project tie themselves to the White House fence during an environmental protest in Washington, DC, United States on February 13, 2013. REUTERS/Jonathan Ernst/File Photo. A major reason the U.S. has been able to cut emissions is the availability of low-priced natural gas. In the last decade, drillers have been able to use hydraulic fracturing and horizontal drilling to unlock vast shale gas reserves. Low-priced natural gas has replaced much U.S. coal-fired capacity in recent years, which has in turn lowered emissions. Additions of wind and solar energy have also played a smaller role in reducing emissions.